There is something genuine and special about this global meeting place of world travelling artists. It offers a high quality tattooing experience in a professional environment where you will receive world class advice and have a wide selection of tattoo styles to choose from. The vibe always includes story telling between travelling tattooers and clients alike, meeting people from all walks of life and getting to hang out, browse or even tattooed. 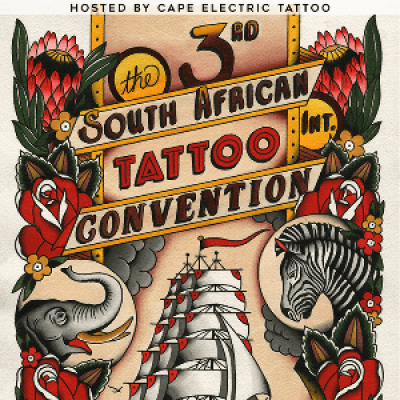 Whether you are collecting a small momento-type tattoo from an artist’s drawing sheet, looking for some fine art prints for your home or commiting to a full day tattoo by your favourite artist, there is an unexplainable magic that happens when so many people come together to share the stoke and get tattooed under one roof. “WALK-INS are also welcome! If you’re comfortable with throwing caution to the wind, buy your tickets to the convention and find an artist on site on the day between 29th – 31st March 2019. Spontaneously select a piece you love and get small, quick sketches and pieces of work known as “flash” designs without needing to pre-plan or pre-book. For all comfirmed tattooers please check out the artist page. Although we have increased our public experience offering we are happy to announce that SAITC ticket prices have remained the same without an increase for 2019.